Getting off the beaten path in Asia can be an incredibly rewarding experience. Despite being the largest continent in the world, travellers often seem to frequent the same places whilst overlooking equally impressive destinations. 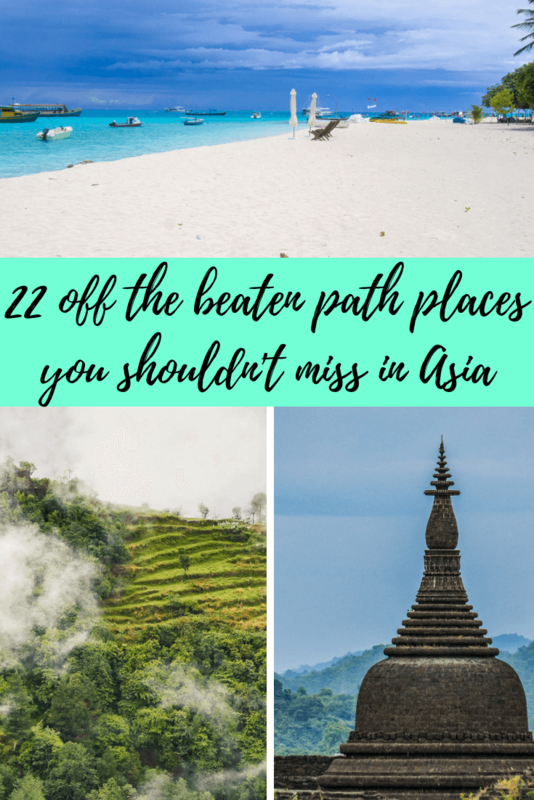 Getting off the beaten track allows you to escape the crowds found elsewhere in Asia, and in many cases save money too, as prices aren’t inflated due to the presence of tourists! Although there are plenty of hidden gems around the continent, it can be a time consuming process figuring out exactly which lesser visited spots are of most interest to you – partly because there are so many to choose from, and partly because there is less information readily available about these places. 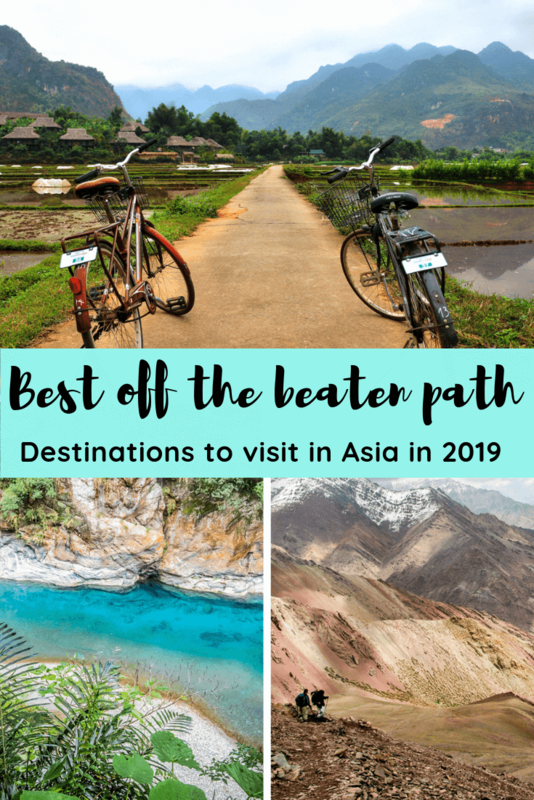 That’s why we asked 22 travel bloggers to tell us all about their recommendations of undiscovered places and off the beaten path destinations to visit in Asia during 2019! Looking for more travel inspiration? Check out our article on the best off the beaten path spots to visit in Europe! 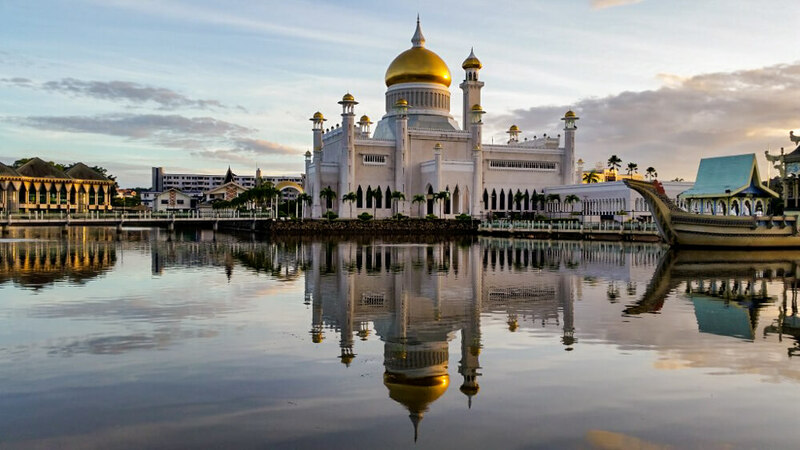 Bandar Seri Begawan, the capital of Brunei, does not receive many visitors, but it is an off the beaten path destination worth visiting. Bandar Seri Begawan (or BSB for short) is a pleasant, quiet and peaceful city. The locals are very friendly and I always felt safe walking anywhere alone even after dark. The downtown area is small and walkable, so you can explore many of its attractions by foot. Bandar Seri Begawan is also budget friendly with many of the top attractions being free to visit. The must see attraction in the city is the Sultan Omar Ali Saifuddien Mosque, which is the tallest building in Brunei. It’s located in the centre of the city and you can’t miss it as its large gold dome dominates the city skyline. The beautiful and ornate mosque is very photogenic – it is surrounded by an artificial lagoon that acts as a reflecting pool making it look like it is floating in water. Another beautiful mosque worth seeing is Jame’ Asri Sultan Hassanal Bolkiah, which is the largest mosque in Brunei and was built to commemorate the current reigning Sultan. Other attractions include Kampong Ayer, which is the largest water village in the world, as well as a large morning market and night market. BSB is also a great base for a day trip to visit the pristine jungle of Ulu Temburong National Park, which is only accessible to visitors on a tour. Brunei is a conservative Muslim country so there are a few things that visitors need to keep in mind. BSB has no nightlife as Brunei has prohibited the sale and public consumption of alcohol. In addition, all attractions and restaurants close by law for a couple of hours on Friday afternoon for prayers. Non Muslims are not required or expected to dress in any particular attire, but it is a good idea to wear clothes that cover knees and shoulders in order to respect the country’s culture and religion. Click here for great accommodation options in Bandar Seri Begawan! Contribution by The Travel Sisters. Gyantse in Tibet is hard to get to, but worth the effort. This small town in the western part of the Tibetan Autonomous region of China is home to one of Tibet’s major monasteries and one of its best-preserved fortresses. Its setting is dramatic, surrounded by the dry but impressive Tibetan plains, 4,000 metres (13,000 feet) above sea level. 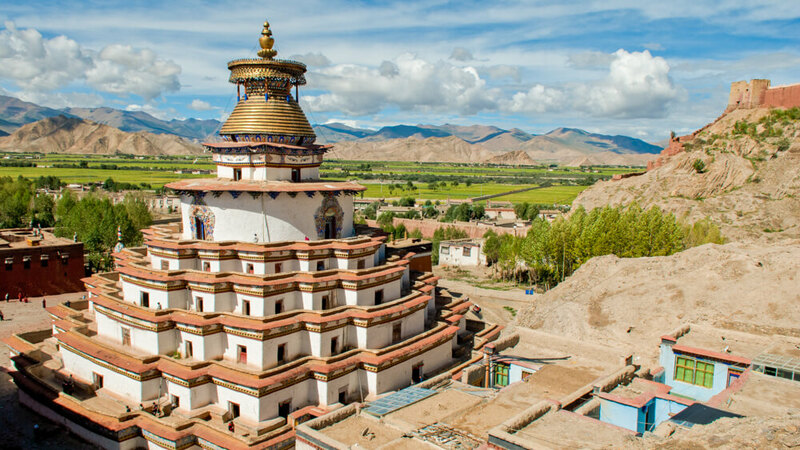 A rocky hill rises out of the centre of town, covered in the walls and buildings of Gyantse Dzong, the restored 13th Century fortress that dominates the town. The fortress has an interesting history, helping the Tibetans hold out against the British in the early 1900’s, and has a small museum that’s worth a quick visit. At one end of town is the Palcho Monastery, which has the largest Stupa/Chorten in Tibet (Pango Chorten), and multiple layers of chapels and tiny rooms filled with statues of gods. The main monastery room smells heavily of yak butter, which is used in the candles that light the monastery. Depending on the time of year, it is possible to see (or join) the monks of Palcho Monastery making huge sand mandalas on the monastery floor. These intricate patterns of colourful sand are swept away days later, symbolising the temporary nature of life. Gyantse has a bit of a wild west feel. In the streets outside, yaks, long-haired donkeys and packs of dogs roam around. Tiny hole-in-the restaurants serve momo, the delicious steamed dumplings common in Tibet, best eaten with a mix of soy and spicy sauces. The ubiquitous yak butter tea, a pungent drink that is definitely an acquired taste, is available everywhere, and frequently offered by Tibetans, who are warm and welcoming hosts with the little they have. Currently, due to travel restrictions, is only possible to visit Tibet on a tour. Any moments away from the tour to experience the quiet moments of Gyantse will be well-rewarded. This is a magical place that few have the good fortune to visit. Tagong is a tiny, traditional, Tibetan town nestled among the hills of the Tibet Plateau in Sichuan Province, China. It’s but a dot on the map, a small vestige of civilisation among the vast wilderness of the Tibetan highlands. If you’re looking to experience Tibet without all the red tape, Tagong is the place to go. When I first arrived in Tagong, I thought it was merely an ethnically Tibetan town in mainland China. Oh boy was I wrong. Tagong is not a small sampling of Tibetan culture where tourists can come and marvel at what once was, Tagong is really and truly in Tibet. This place is not for show. It just is what it’s always been, a small village in Tibet. The locals here do not consider themselves Chinese, nor do they think they live in China. Nothing smacked my perceptions in the face more than a local telling me “Welcome to Tibet!” shortly after I arrived. While the locals in Tagong are incredibly friendly and welcoming, your biggest asset when coming to town has to be a lovely American woman named Angela, who, along with her Tibetan husband, owns and runs Khampa Nomad Ecolodge. Angela knows everything there is to know about the region. She can organise treks in the mountains on foot or by horse, nomad homestays, and can answer all of your questions about Tibetan culture and way of life. I stayed with Angela for 3 weeks when I came to Tagong, and, honestly, I never wanted to leave! Things to do in Tagong include, hiking, horseback riding, cycling, nomad homestays, visiting monasteries and temples, and, if you come in July, experiencing the Tagong Horse Festival, a dazzling display of horsemanship. The only downside of Tagong is that it’s very much off the beaten path. To get here requires two days of travel by long distance bus and local van. Your journey will start in Chengdu, where you have to take a bus for 9-10 hours to the city of Kangding. From here it’s just a short 2 hour van ride up the mountain to Tagong. You’ll most likely have to stay the night in Kangding as the majority of vans leave for Tagong only in the morning. Despite the long travel days, taking the time to get off the beaten path and visit Tagong is well worth the effort. 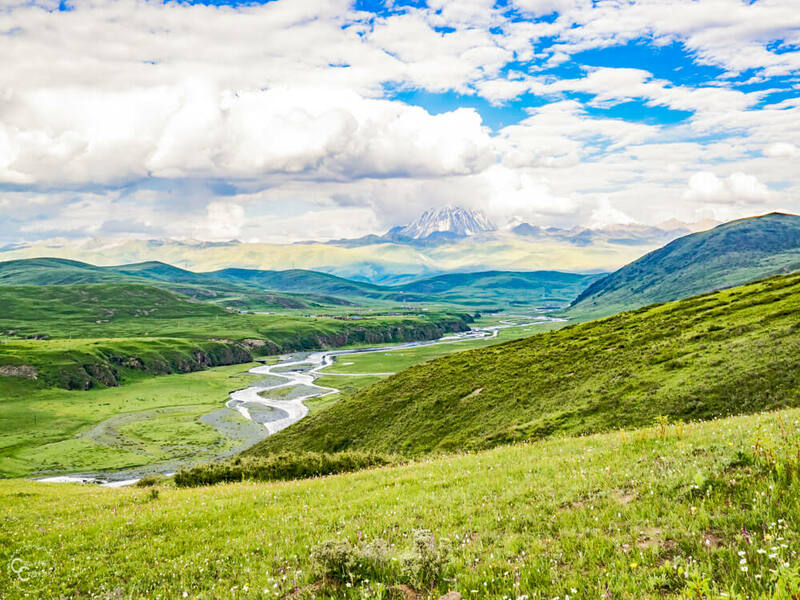 You’ll get to see a part of China most don’t even know exists, visit Tibet without a tour or special permit, and experience the breathtaking natural scenery of the Tibetan plateau. 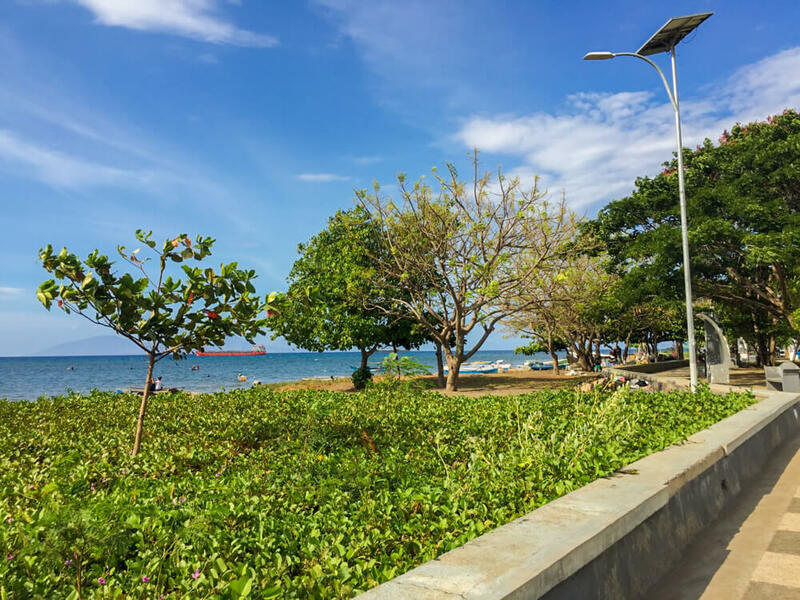 It’s rare for travellers to visit Dili, or even its country, Timor-Leste. It’s hard to reach, with infrequent direct flights from Singapore or a daily flight from Darwin. Either way the planes are small and chances are you’ll have a row all to yourself. East Timor, as it’s known in English, was the first country to gain independence this millennium, in 2002. It survived Portuguese colonialism only to be invaded by Indonesia, who own the western part of the island. The war for independence was violent, lasted two decades and took many lives, although walking along the city’s peaceful shoreline, it’s hard to believe a hair was ever out of place. This is not quite a tourist destination. Accommodation is scarce, especially in the budget range, and tourism is still in its infancy, although there are plenty of forward-looking restaurateurs grabbing shoreline premises to open a restaurant with a view. Being by the sea, the seafood is fresh and the local coffee – from nearby plantations – is delicious. A brilliant thing to do is grab a minibus or taxi to the end of the bay at sunrise, and climb the 500 steps to the statue of Cristo Rei to watch the sun climb into the sky. Dili is tropical, and sunrise is one of the few times of day that it’s cool enough for you to do this kind of exercise. The city has made efforts to preserve some of its historical heritage so you’ll see plenty of statues and buildings dating back to various administrations. But make no mistake: this is not an Asian tiger. On the contrary, East Timor is a poor country with a rickety infrastructure, poor water and sanitation, and unfinished roads. It’s also full of young welcoming people, and decent wifi coverage with a SIM card you can buy in some of the major hotels. Given the lack of tourism, there’s a surprising amount to do. The Museum of East Timorese Resistance traces the fight for independence and is well laid out, and in English. The Tais Market showcases local beadwork and weaving, some of it quite intricate. Or just walk along the promenade by the sea, where couples kiss, mothers cook and sell food, and men oil their motorcycles or pick up refuse. Off the coast, two activities beckon: dolphin and whale watching during the season, and diving off Atauro Island, still relatively untouched and unexplored. It might not remain this way forever. Click here to check out the accommodation options in Dili! Contribution by Women on the Road. Tbilisi, the capital city of Georgia, is a lesser-visited city, making it a brilliant off the beaten track spot to visit in Asia. 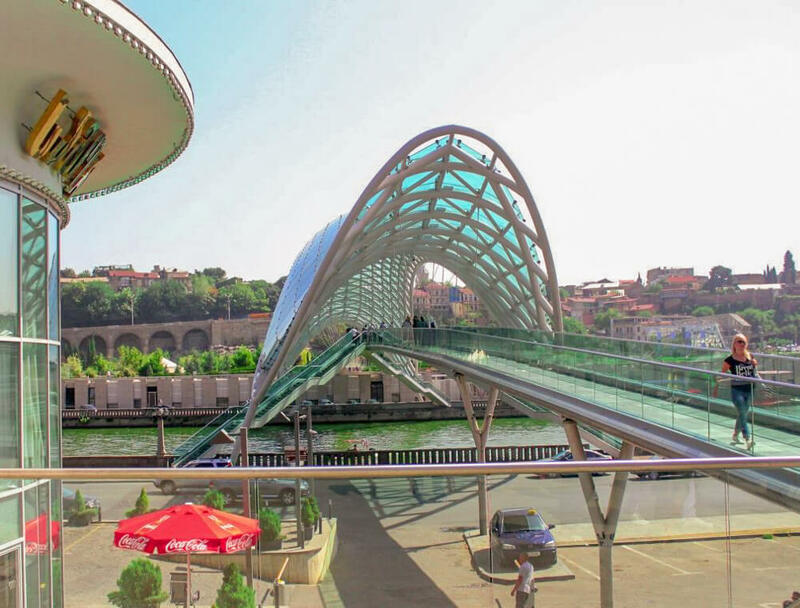 Not many people know that Tbilisi is a historically and culturally rich city with influence from the Ottomans, Russians, Turkish as well as Arabs who passed through the city centuries back and left a significant mark, which is still very evident in the city. From the cobbled lively streets of the Rustaveli Avenue to the centuries-old forts and churches, Tbilisi has plenty to offer to the curious traveler. The city is particularly famous for its Sulphur Baths, with the oldest surviving baths in the city dating back to the early 16th century. Taking a mineral-rich Sulphur bath is one of the best things to do in Tbilisi. Another great thing to do is take the funicular to the top of the Mt. Mtatsminda for a wonderful panoramic view of the city. The Mother of Georgia sculpture that stands tall near the Narikala Fort is another of the city’s highlights. It is a 20 metre tall aluminium statue of a lady holding a sword in one hand for the enemy and a glass of wine in the other hand to welcome the friend. Tbilisi also happens to be an extremely budget-friendly city to visit. Hostels are super cheap and dorm rooms can be booked for as little as $2 USD. On top of this, a huge meal can be enjoyed for less than $5 USD – which represents incredible value! With tourism infrastructure being gradually developed in the city, Tbilisi is a great off the beaten path spot in Asia for 2019. P.S: Tbilisi, Georgia has been included in this list of Asian destinations due to the dispute over which continent(s); Europe or Asia, the country is on. Click here for great accommodation options in Tbilisi! Contribution by The Sane Adventurer. Jaisalmer, located in the heart of the Thar Desert, is a must see off the beaten path city in Rajasthan, India. 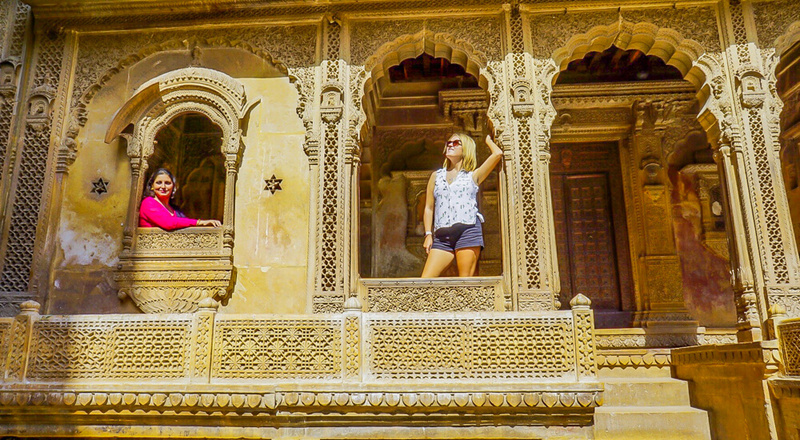 Jaisalmer is known as the “golden city” of India, and walking around you will quickly begin to understand why. Yellow sandstone is a common feature of the city’s architecture and can be seen all over, from the impressive Jaisalmer fort to the intricately carved sculptures in the old town. The Jaisalmer fort goes by name “Golden Fort” as it rises from the desert and becomes one with the golden hues of the sand. Forts are found all throughout India, but the Jaisalmer fort is one of the most unique as it is among the few living forts in the world – nearly a quarter of the old city’s population still resides within the fort. Walking through the fort you will see bustling markets and locals living their day-to-day life. Jaisalmer is also known for the architecture of its magnificent historic mansions, located both inside and out of the fort. Walking around the city is a non-stop photo op! Jaisalmer is also the best place in India to do a camel safari, due to the proximity to the Thar desert which is filled with impressive sand dunes. Overnight tours can be booked from town for as little as 1500 rupees ($20 USD). Tours include a camel ride out to the middle of the desert where you will spend the night sleeping under millions of stars. Taking a camel safari gives visitors the opportunity to witness the rustic, rural desert life of India that is different to the rest of the country. Jaisalmer is a unique and relaxing place to visit with a great small-town feel. Plan at least two days to visit the city, and add more time if you want to explore the desert. Click here for brilliant accommodation deals in Jaisalmer! Contribution by Explore with Lora. Located in the disputed Kashmir region of North India, Ladakh is one of the most interesting places in the country. This region is also known as Little Tibet and it’s easy to understand why. The culture has a lot of things in common with Tibet: most people are Buddhist; thousands of Tibetan refugees live there; and they even have a monastery that looks like the Potala Monastery in Lhasa. The truth is that visiting Ladakh is totally different from visiting other places like Rajasthan or Varanasi. Ladakh is right in the middle of the Indian Himalayan Region, so I recommend that you go explore the mountains while you are there. From short, one-day hikes to more adventurous multi-day expeditions, there are trekking options for all kinds of visitors. 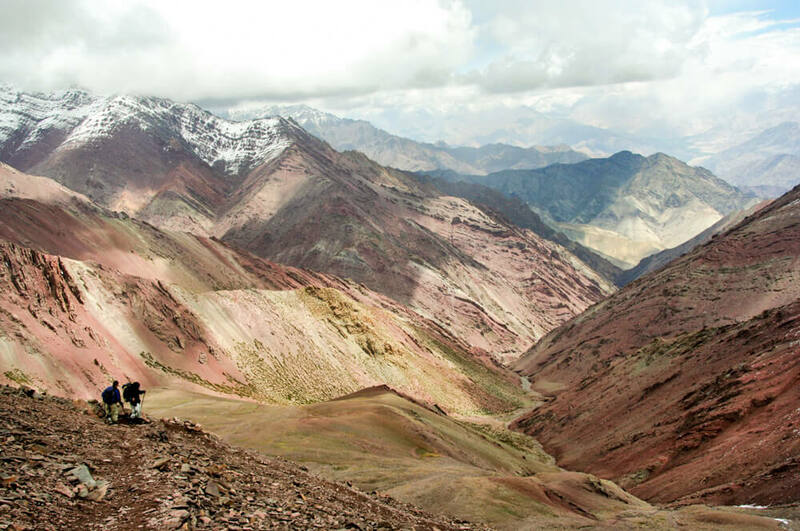 One of the most popular options is the hike along the Markha Valley. This beautiful hike will take you along huge valleys, vertigo cliffs, moon-like landscapes and traditional villages. The trek can be completed in 7 days, and is of medium difficulty. Another good thing is that you don’t need to bring any camping gear because you can sleep in the local homestays scattered along the valleys. Although a guide is not mandatory, I recommend that you hire one just to be on the safe side. It’s best to visit the region between May and September, as the temperatures are pleasant and hiking trails are open. I’m sure that Ladakh must look beautiful in winter, but the temperatures can drop as low as minus 23 degrees celsius. Keep in mind that the road access from Manali is closed in winter due the snow. Sulawesi, Indonesia, isn’t your typical holiday destination, but that is exactly why I love it. Sulawesi feels like an adventure, it feels like it is promising exploration. Here are some of my favourite places to explore on the island. Tangkoko National Park is one of my favourite destinations on Sulawesi. Hiking through the jungle feels like you are far from civilisation especially when you come across Black Crested Macaques and Tarsiers – tiny primates with distinctively big eyes. Once you trek through the jungle then you will arrive at a black sand beach – the ‘brightest’ black sand beach I’ve ever seen! 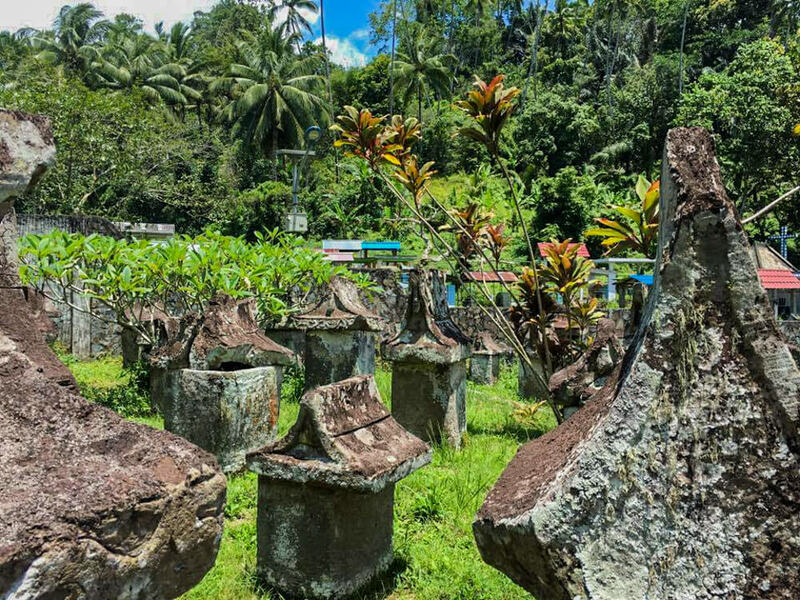 It’s also worth visiting the Waruga Stones, which appear to be stone like houses but are actually sarcophagi (stone coffins) that date back to the 9th century. They are listed as a UNESCO World Heritage Site and really are a hidden gem. On the top of the Warugas there are little stone notches that indicate how many bodies are inside. It may be a bit morbid, but it’s a very interesting part of the area’s history. Another interesting and very different place is the Hill of Love, which was built in 2002 and is dedicated to the five religions of Manado (Christianity, Buddhism, Islam, Hinduism and the Catholics). There are two different paths you can take – the hard one (left) or the easier one (right). The hard path involves requires you to climb up 2,435 very steep steps to reach Bukit Kasih Peak, where you will find a giant white cross. Just a heads up, the whole place smells like rotten eggs as the hill is sulphuric and there are clouds of sulphur spilling out from the ground. Manado is the capital of North Sulawesi and is the second largest city in all of Sulawesi. Indonesia is a predominately Muslim country but you would be surprised to learn that a statue of Jesus Christ is a major attraction. It is even the fourth largest statue of its kind in the world! Sulawesi really is a hidden gem in Asia that is worth exploring. Click here to find accommodation in Manado, Sulawesi! Contribution by Through an Aussie’s Eyes. A flight away from the ever popular Bali, Sumba feels like a completely different world. Wild, off-the-beaten path, and rugged are words that aptly describe this island in the East Nusa Tenggara province of Indonesia. The surfers have discovered this island and domestic tourism is slowly picking up. Despite this, the island still gets relatively few visitors. Relatively untouched, the beaches here are wild, the roads are rough, and tourist infrastructure is few and far between. Despite the isolated and stunning beaches most are not serviced, so don’t expect any cold beer, bathrooms, or restaurants. So, why would you go to Sumba? 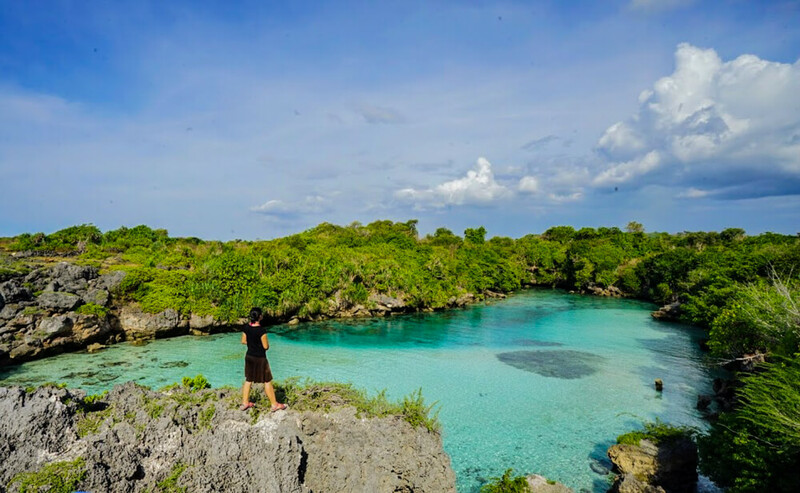 What you get for this wildness are miles of empty white sand beaches (Waingapu and Tarimbang), waterfalls (Tenggedu and Lapopu Waterfall), and mangrove forests all for yourself. You simply cannot miss the dancing mangrove forest of Walakiri Beach, which is especially stunning at sunset. The Instagram-worthy Weekuri Lagoon is another can’t-miss spot – a wonderfully clear blue lagoon with access to the ocean. You also get to experience the unique indigenous Marapu culture. The tribes who live on Sumba still live by the old Adat tradition. They live in houses with tall, sloping roofs made of dried grass and bury their ancestors inside massive stone tombs in their front yard. Some of these villages are open to visitors (e.g. Kampung Ratenggaro). This destination is not the easiest for independent travellers, but those who make the journey will get to experience wild Indonesia as its best. To get to Sumba from Bali, take a flight from Denpasar to either Tambolaka or Waingapu. The easiest way to get around is to hire a driver to take you to various places during your stay. Click here to see the accommodation options on Sumba Island! Contribution by Jack and Jill travel. 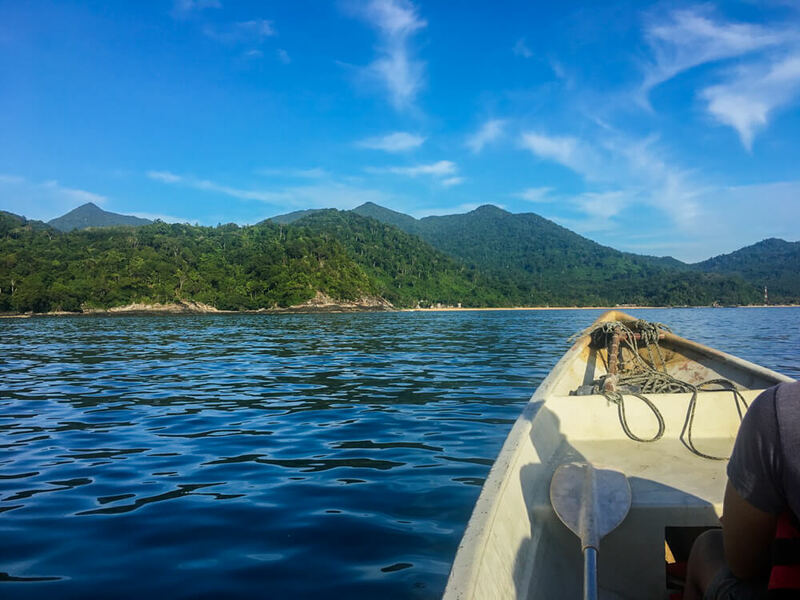 Malaysia is a beautiful country to visit, and our favourite place of all was Tioman Island. Pulau Tioman lies off the east coast of Peninsular Malaysia, and it’s the largest island of over 60 in the area. Tioman is still covered by thick rainforest and is a real island paradise! Only the beaches are inhabited by locals and accommodation providers, while inland is a haven for trekking to waterfalls and exploring the island’s pristine beauty. We spent two weeks in Juara Bay, which is on the east side of the island. It has a beautiful beachfront that is calm and safe because it’s wrapped on both sides by the island, and the water is warm and shallow too. It has two great snorkelling sites with coral reefs, and further out are excellent diving sites too. At one end of Juara Bay there is a mangrove forest that you can kayak down, where we spotted monkeys and sleeping pythons. While on Tioman Island our family volunteered for a week with the Juara Turtle Project, which was one of the highlights of our 4-month trip. We loved being able to get close to baby sea turtles in a safe and supportive way, and being able to help the project’s excellent work. We also made many new friends and really enjoyed the atmosphere there, which was fun and welcoming. If you want to give back a little and have a chance to meet other travellers from all over the world, we highly recommend their volunteer program. It takes about 2 hours by ferry to reach Tioman Island from Mersing. There are varied accommodation options in Juara Bay and at several other locations around the island too, ranging from 5-star resorts to basic island huts. There are also great dining options and some small stores on Tioman, as well as hire equipment shops for any water experiences you wish to try. 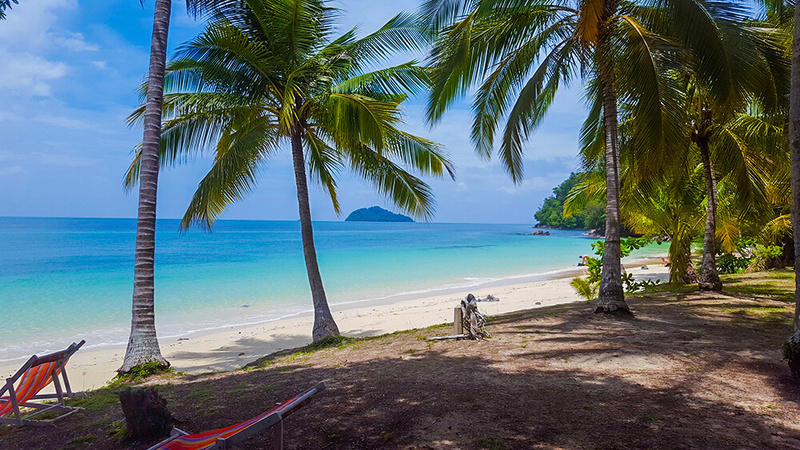 Click here to check out the brilliant accommodation options on Tioman Island! Contribution by Small Footprints, Big Adventures. Until 2009 visitors to the Maldives could only stay on uninhabited resort islands, away from the Muslim population. Since then guesthouses have opened on local inhabited islands and independent travellers can now experience the country on a budget and get an insight into local life. Fulidhoo is one if the best local islands to visit in the Maldives. You won’t find over-water bungalows, sunset cocktails, or infinity pools, but the beaches are powdery white and the sea a clear turquoise. It’s a different kind of paradise island. Fulidhoo is easy to get to as it’s only a 3.5 hour ferry ride from the capital Male, and if you’re lucky you may even see dolphins on the way. There’s no motorised transport on the island and it’s so tiny, just 675 metres by 200 metres, that even a bicycle isn’t necessary. Your guesthouse owner will meet you at the ferry with a wheelbarrow for your luggage. There are only a few guesthouses and local restaurants on the island. We ate at our accommodation, Thundi Guesthouse, and the food was better than we expected for vegetarians in such a remote place where the cuisine focuses on fish and coconuts. Due to the Muslim population (of just 400 people), the main beach is not the place for sunbathing – local women swim fully clothed and bikinis would offend the locals. They get around this issue by having a separate “bikini beach” for tourists at the far end of the island. It’s a lovely place to relax and for most of our stay we had it to ourselves. If you’re feeling active, you can borrow snorkels from the guesthouses or your host can arrange snorkelling and other boat trips. We were happy with our lazy days of walks, swims, and naps. We swung in hammocks, gazed at the ocean, and watched stingrays swimming past the jetty. Our only mistake was not staying more than two nights. It was hard to leave paradise behind. Contribution by Never Ending Voyage. Mrauk U, often dubbed as the lost city of Burma, is a small, remote town in northwestern Myanmar. In its prime, Mrauk U was the capital city of the ancient Arakan Empire. It was rich, prosperous, and famous. Today, Mrauk U is a wonderful collection of pagodas in ruins, waiting for the world to discover them. You can get to Mrauk U from Sittwe, the nearest city with an airport, by road. The journey takes about 3 hours but is totally worth it. Mrauk U gets less than 5000 tourists in a year while its more popular cousin, Bagan, gets more than 250,000. This means Mrauk U is still relatively unexplored and pristine and makes for a great destination if you are looking for some peaceful time with yourself. The pagodas of Mrauk U are over 800 years old and made of stone. They are in various states of repair, some of them still mounds of stone covered by thick vegetation. 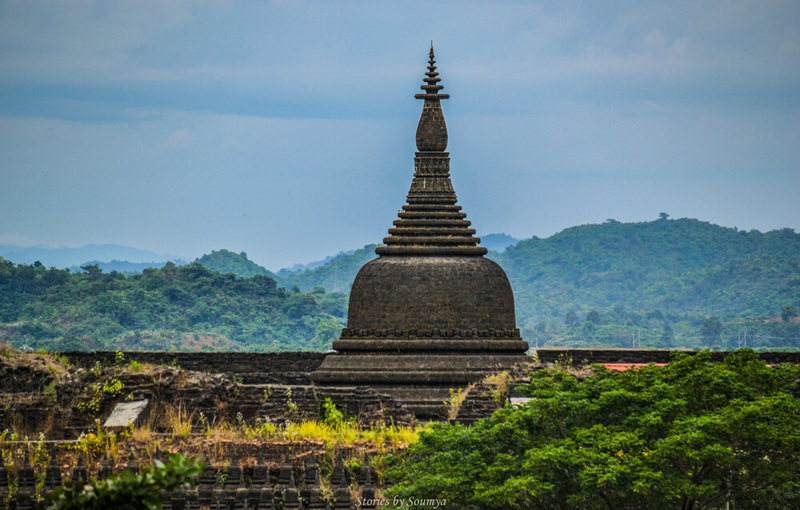 With plenty of pagodas to discover, Mrauk U is a wonderful place to explore. The temples are divided into four different groups: North, South, East, and West. The Northern Group is the largest and features some of the most impressive pagodas. The Shittaung, the Dukkathein, and the Andaw Thein pagodas are unmissable. Additionally, you can taste some delicious Rakhine cuisine when you are here. Their shrimp curry is lip smacking good. Mrauk U is a sleepy, little town without the crowds. You won’t get the best of amenities here. What you will get is lots of love and smiles. And history, of course! Click here to check out the accommodation options in Mrauk U! Contribution by Stories by Soumya. Annapurna is a section of the Himalayas in the centre and north of Nepal famous for its high summits such as Annapurna I (8,091 metres), 13 peaks over 7,000 metres and another 16 over 6,000 metres. The Annapurna Massif and its surroundings are a protected area of 7,629 square kilometres, the first conservation area in Nepal. In this area, there are numerous hiking trails and routes known worldwide. There are three main trekking routes in the Annapurna region: the Jomson Trek, the route from the Annapurna Sanctuary to the Annapurna base camp, and the circuit of the Annapurnas, that surrounds the Annapurna Himal itself and includes the Jomsom route. Usually, the nearby city of Pokhara serves as a starting point for these walks. Pokhara is also a good starting point for other short walks of one or several days, such as Ghorepani, Ghandruk, or the new Annapurna Community Trek to Mohare Danda (aka Mohare Hill). I was lucky to walk the community trek last year after a brief road trip through some of the country main touristy hubs: Kathmandu, Panauti, and Pokhara. Way less visited than other parts of the country, the Annapurna region is well worth exploring over a time span of at least a couple of weeks, as the body needs time to adjust to the height and you can only go up one day so much. In fact, it is recommended to ascend not more than a few hundred metres each day, especially when the altitude is over 3000 metres. If you decide to give trekking in Nepal a go, get ready for the challenge before getting there, as it is not your regular day hike kind of adventure – unless you are a trained trekker, then you should be fine. Also, make sure you go before the rainy season. Trekking in the rain for hours might be ok for some of you, however, I can ensure you leeches won’t be! You have been warned. Click here to check out great value accommodation in Pokhara! Contribution by A World to Travel. I had a month long trip planned, without any set Philippines itinerary. I planned for two weeks on Cebu and two in North Luzon, but actually ended up on Palawan instead. I spent one week on Malapascua and had to decide where to go next when I remembered briefly reading about the nearby Bantayan Island. With no real idea of what it had to offer, I decided to go. It’s pretty easy to get there in just a few steps. From wherever you are, get to Cebu City. Take a taxi to the north terminal bus station and get a bus to Hagnaya. From there you can take a ferry over to Bantayan. I just followed the group from the bus to figure out which ferry it was. Once the ferry gets to Bantayan, take a tricycle into town to get to your accommodation. 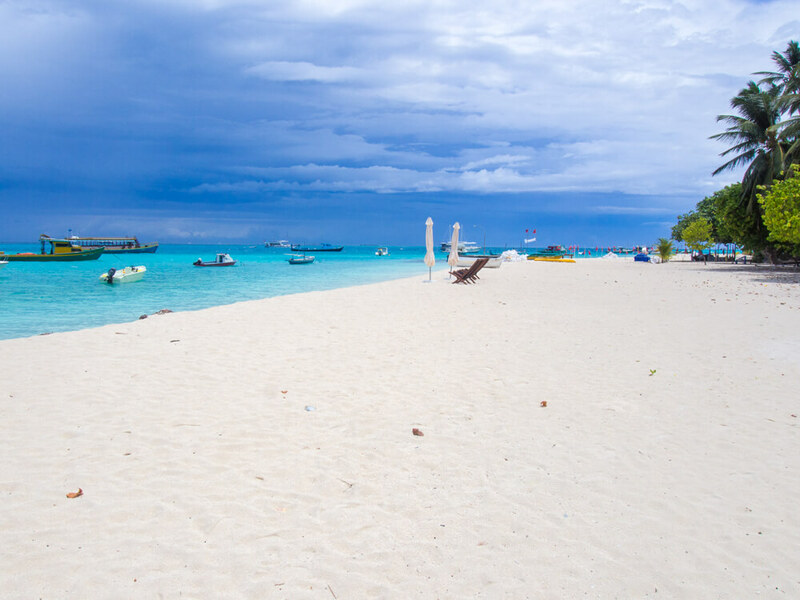 Bantayan is a great destination for beach lovers looking to get off the beaten path in Asia. It’s a sleepy little island that’s actually not so little. Compared to the hoppin’ El Nido, this is a breath of fresh, salty air. It has a huge, perfect white sand beach so you’re bound to find a spot to yourself. You’ll also find adorable little bungalows along the beach that are surprisingly affordable. Not quite backpacker budget, but not breaking the bank, either. Spend your days relaxing on the perfect white beach or take an island hopping/snorkelling trip to relax on other perfect beaches nearby. Rent a scooter or take a Jeepney to explore the rest of the island. Visit Ogtong cave or go see the Omagieca Mangrove Garden. If you want to do something a little more daring, you can even go skydiving. Since this is more of a holiday destination than a backpacker paradise, you won’t be running into backpackers everywhere. I actually saw very few aside from the two I met back up with there. I think it’s the perfect off the beaten path island because it has enough to do and see, but it’s still extremely reasonably priced and unknown enough to be awesome. No one else that I met on Malapascua had heard of it when I was deciding where to go next. Contribution by Red Around the World. South Korea is a popular destination with Asian tourists but is still less explored by travellers from the rest of the world. Busan counts 3.5 million inhabitants, making it South Korea’s second largest city after Seoul. The city’s prosperous economy and pleasant climate continues to draw new inhabitants and the city continues to grow fast. Foreign tourists often overlook Busan, making it a great destination if you’re looking for an off the beaten path city to visit in Asia! The location near the coast makes it a paradise for lovers of fresh seafood, and every year during summer lots of tourists are drawn to its beaches. Several sources recognise Haeundae and Gwangali beach as the best to be found in South Korea. The mountainous region to the north and west of the city attracts many hikers, while shopaholics love the large shopping malls of Lotte and Shinsegae. But that’s not all that Busan has to offer. Foreign tourists should take some time to wander through the narrow colourful streets of the Gamcheon Cultural village. This area used to be a shanty town but has undergone a complete make-over. The residents have done such a good job of restoring their neighbourhood that it is now known as Korea’s Santorini. Visitors will also be amazed by the beauty of the Haedong Yonggungsa temple. This photogenic temple offers breathtaking views and is also known as the Water temple for its location along the coastline. A little outside of Busan is Taejongdae Resort park, a peninsula that offers more wonderful views. What we loved most about this park is the spectacular rocky coastline and the splendid views on the sea with its different shades of blue. 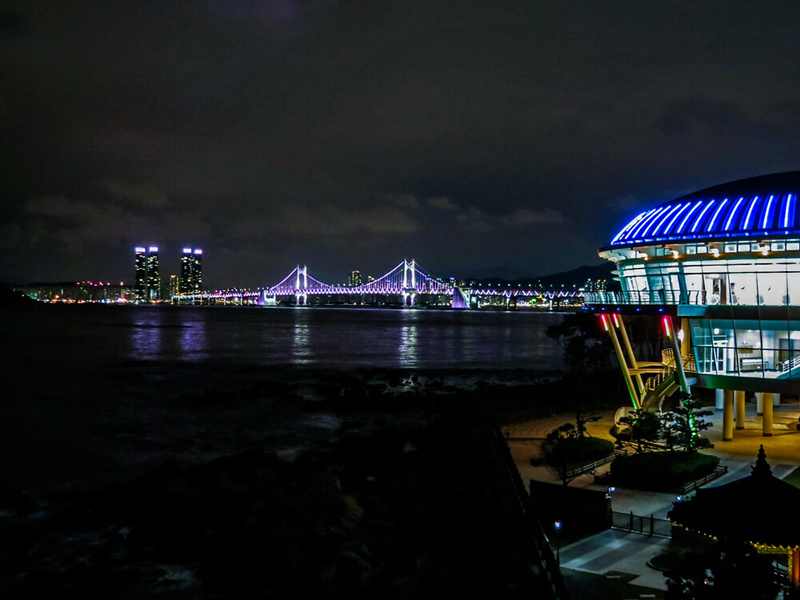 Busan can be visited at any time of the year. Its ideal location, bordered by the ocean on the south and low mountains on the north and west, result in a more or less pleasant climate all-year round. Temperatures rarely rise above 32 degrees in summer and winters are generally mild. Click here for great deals on accommodation in Busan! Located in the Jeolla Province of South Korea, Jeonju is a stunning city known for its hanok village and the famous bibimbap dish. It is a 3 hour bus ride away from Seoul or a 1.5 hour train ride. The city itself is rather small, but has quite a lot to offer to foreign and local tourists. Although it’s not one of the most visited places in the country and is often forgotten about, it’s definitely worth including Jeonju on your Korea itinerary. Most of the tourist attractions lie in the hanok village, which used to be the old city centre. It is a 10 minute taxi ride away from the express bus terminal. The main sight is the Gyeonggijeon Shrine and royal portrait museum. One of the most important paintings of the Joseon Dynasty can be found inside the museum, namely the portrait of the founder of the last Korean Dynasty, King Tae-jo. It also holds the mortuary tablets of the king and his wife. Next to the shrine lies the Jeongdong Catholic Church, which was built to commemorate all the martyrs that died in that very same spot during the Joseon Dynasty. Another great place to visit is the Jeonjuhyanggyo Confucian School. 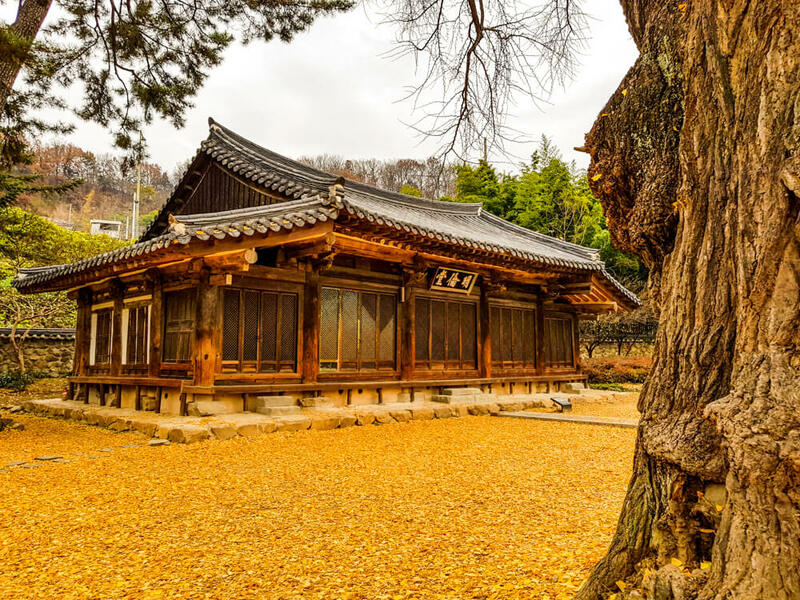 This is located a short walk away from the hanok village but is a stunning and peaceful place that is definitely worth the visit. It used to be an educational centre for the ‘Yangbang’, who were mainly sons from rich noblemen families during the Joseon Dynasty. The school is free to enter and it is especially stunning during autumn or spring, when the colours of the tree are golden yellow or pink. When visiting Jeonju it is recommended to stay at least 2 days and stay one night in a traditional hanok accommodation in the village. These are surprisingly affordable and a great Korean experience. You should also try bibimbap and beansprout soup – two dishes that are typical from Jeonju. Click here to check out the accommodation available in Jeonju! Contribution by Be Marie Korea. Wellawaya is one of the nicest places to visit in Sri Lanka, and although local people visit the village and the beautiful surroundings (especially the nearby Buduruvagala Buddhist temple) regularly, it’s a great destination for travellers looking to get off the beaten path in Asia. Around 20 kilometres or a 30 minute bus ride from the more popular Ella (a famous backpacker destination), Wellawaya is certainly one of Sri Lanka’s less visited destinations, and as such has retained all of its character. While this small town is rather non-descript (small houses, a bunch of local shops, a fruit and vegetable market), as are many towns in the country, the area is still incredibly beautiful. The setting is stunning: imagine windy roads that cut across the greenest forest you can think of, while women and children wearing colourful sarees walk around, waving at passersby. It’s so peaceful that dogs sleep undisturbed in the middle of the road. The occasional tuk tuk is a far away reminder that you are in the 21st century after all. The area is packed with beautiful wildlife. Like many other places in Sri Lanka there are monkeys, but the area is also home to frogs, owls, peacocks (whose mating season is in September) and even flying squirrels. Adding to this already incredible place, there are various waterfalls and swimming holes scattered around the area. Elle Wala is the best known one, and even then, it hardly gets any visitors. It’s a gorgeous place: giant boulders surround a stunning waterfall and shallow, yet freezing, pool at the base of the falls. The only company visitors get is that of the two dogs that live in the vicinity and that happily show the trail. Buduruvagala is a beautiful Buddhist temple 7 kilometres south of Wellawaya. It’s a steal to get in (around $2 USD) and the experience is great. Even at pooja (prayer time), this temple of carved Buddhas dating back to the 10th century remains quiet and peaceful. Click here to check out the accommodation options in Wellawaya! Contribution by My Adventures Across the World. Many visitors head to the popular city of Taipei when they go to Taiwan. However, there are other locations on the island that provide nature, tranquility, and fewer crowds. If you are looking for the next adventure in Taiwan, consider going to Jade Mountain (also known as Yushan). Jade Mountain is an iconic location as it is the highest peak in Taiwan at 3,952 metres (12,966 feet). The best way to see the peak is via a 31 kilometre (19.2 mile) hiking excursion. It is recommended to go up in two days, but our group completed Jade Mountain in just one day. How do you visit the mountain? Some preparation is required as visitors need to receive permits for the park entry and hiking. Therefore, you will not see the massive crowds here. In addition, visitors must make reservations in advance for the two lodges – one at the base and one halfway up the route – to stay overnight. Climbing Jade Mountain is no easy task. The weather is chilly and the air is thin due to the altitude. Visitors must wear appropriate clothing (layering helps) and hiking shoes. With the overgrown tree roots, narrow walking trail, and scrambling your way up the rocks, it is quite an adventure. Once you reach the summit, it is a rewarding feeling to see the spectacular views of the mountain range. 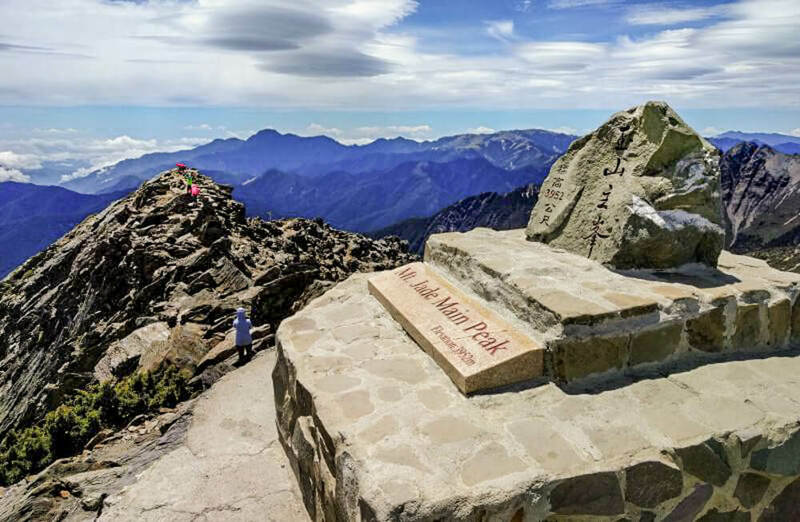 Don’t forget to take a photo with the Jade Mountain Main Peak sign to remember your accomplishments. Coming down the mountain is much easier and faster than going up. Jade Mountain in Taiwan is a simply amazing spot to visit if you’re looking to get off the beaten track in Asia. You won’t regret the opportunity to exercise, spend time with friends, and explore the outdoors. Contribution by Life of Doing. 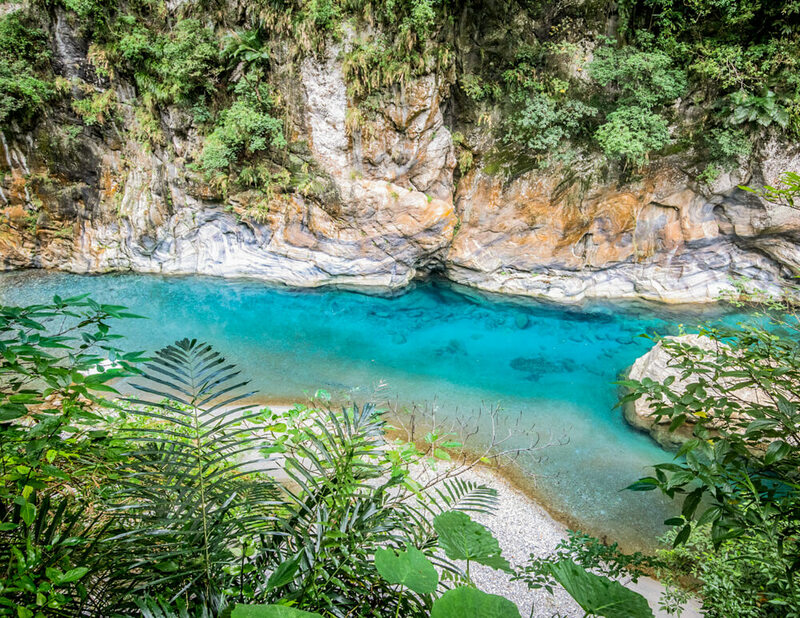 In the wild and rugged East Coast of Taiwan, Taroko Gorge is a natural wonder that is popular with domestic travellers but remains largely off the radar for the rest of the world. The main reason to visit is to get up close to the incredible gorge itself with its excellent walking tracks. The hiking trails have something for everyone, ranging from completely flat to relentlessly steep. The best place to start is Swallow Grotto – where the gorge is at its deepest. Here you can take the short walking trail along the river and gaze in awe at the towering cliffs, milky blue river and the swallows swooping overhead. One of the most popular tracks in the park is the Shakadang Trail, where you follow a river with such incredibly blue water that it almost doesn’t look real. When you see it in pictures, it looks like it has been photo-shopped so you need to get there and see it with your own eyes to believe it! 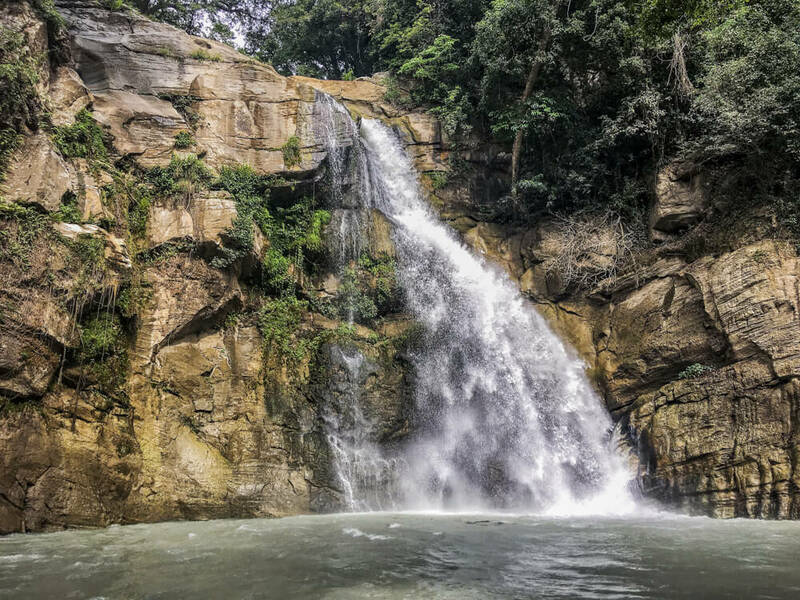 If you’re a fan of waterfalls, then the Baiyang Trail is the one for you. After 2 kilometres of easy walking you arrive at a view of three waterfalls on top of each other intersected by a pretty swing bridge. It was a view so good that we stayed for an hour just to take it all in! From here you can go on to the Water Curtain Cave, where a small waterfall has formed in the cave. The locals tell you it’s a cave of eternal rainfall and you’ll see Taiwanese people of all ages eagerly head to the cave decked out in ponchos. Taroko is also home to one of the most unique temples we’ve ever seen: the Shrine of Eternals Springs. This temple is literally built on top of a waterfall, with the falls flowing through the shrine! It’s a beautiful sight especially if you catch it in the early morning or late afternoon light. Getting to Xincheng (the town nearest to Taroko) is easy as there are three direct trains a day from Taipei. However, you’ll want to hire a motorbike or driver to really explore the gorge as the distances between sights are quite large. Alternatively you can take the local bus, but it offers less freedom. Contribution by Walk My World. There is no place in Thailand more off the beaten track than the tiny island of Koh Bulon Lae. Only a handful of tourists visit each year and most of them keep returning year in and year out. In fact, they’d probably be furious with me for telling the world about their ‘secret’ paradise island! Koh Bulon Lae is located in the Andaman Sea to the west of the Satun Province of Southern Thailand. It is on the ferry route from Koh Mook to Koh Lipe, but there isn’t even a jetty for the ferries to anchor on. Prepare to jump into the water and carry your bags above your head to the shore. 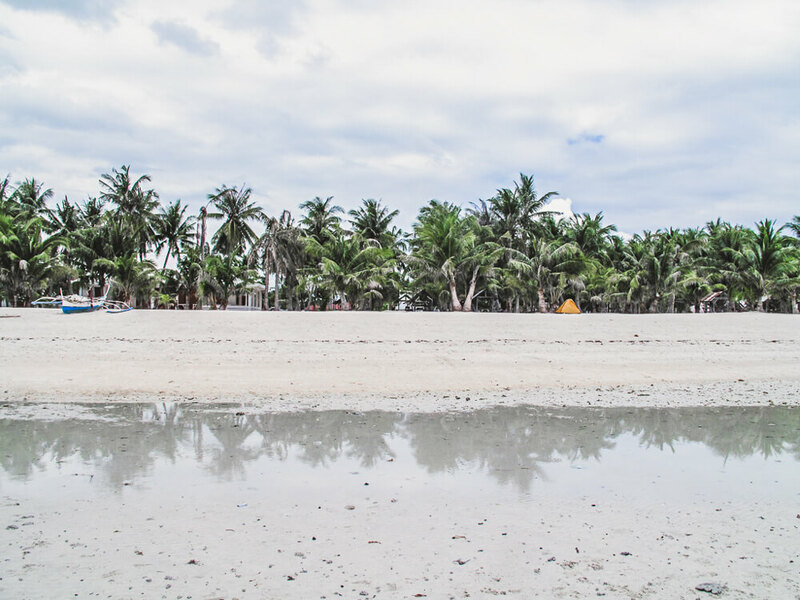 On arrival, all you see is a long stretch of brilliantly white sand and a forest of palm trees. Not a building or a road in sight. The only sign of human presence is two coconuts fashioned to look like faces and places on top of long poles. They are the welcoming committee! The island of Koh Bulon Lae is one of Thailand’s only eco-friendly islands. There is no electricity during the day, with only solar-powered electricity coming on for a few hours in the evening. everything is recycled and the island is pristine. There are only a handful of places to stay and no new places will be allowed to be built in order to preserve the sustainability of this magical island. The east side of the island has the best beach – School Beach – with its blindingly white sand and turquoise waters. The beaches to the north (Phangka Bay and Ao Phangka Noi) are tidal and mangrove swampy, so not always ideal for swimming. The accommodation in the north is cheaper than in the east and there are some great restaurants. The island is really small and it only takes 20 minutes to walk from one side to the other – so everything is easily accessible. If you’re looking for a wild nightlife, you won’t find it here. The Coconut Bar is a great place to hang out for a few drinks, but the draw here is to relax away from the maddening world. Grab goggles and a snorkel, paddle around the island on a kayak, visit the rubber plantation or go on a fishing trip with a local, but most importantly, lie back on the stunning beaches and relax! Contribution by Learning to Breathe Abroad. Often referred to as Vietnam’s ‘final frontier’, the rugged and breathtakingly beautiful Ha Giang Province in the country’s far north is a fantastic destination for offbeat travellers. I spent a year living in Vietnam and travelled through most of the country, and can fairly say that Ha Giang has a very unique feel. Ha Giang is located 300 kilometres north of Hanoi and 250 kilometres east of Sapa and hugs the Vietnam-China border. One of the most remote parts of the country, it was the last area to open up to tourism. Because of its close proximity to the border, foreigners require a special permit to travel around Ha Giang. You can obtain the paperwork for a small fee in the province’s biggest city, Dong Van. Most tourists travel along the Dong Van Loop – a circular route through some of Ha Giang’s most beautiful landscapes. Parts of the itinerary carry names like ‘Happiness Road’ and ‘Heaven’s Gate’, such is the scenery. The road winds past deep ravines, crystal blue rivers and rocky peaks. Travelling between small ethnic minority villages and larger towns, you can find accommodation in homestays and small hotels. Highlights include visiting local markets, trekking, and natural attractions such as the Dong Van Karst Plateau – impressive limestone formations (similar to those in Halong Bay) – and the Ma Pi Leng Pass. 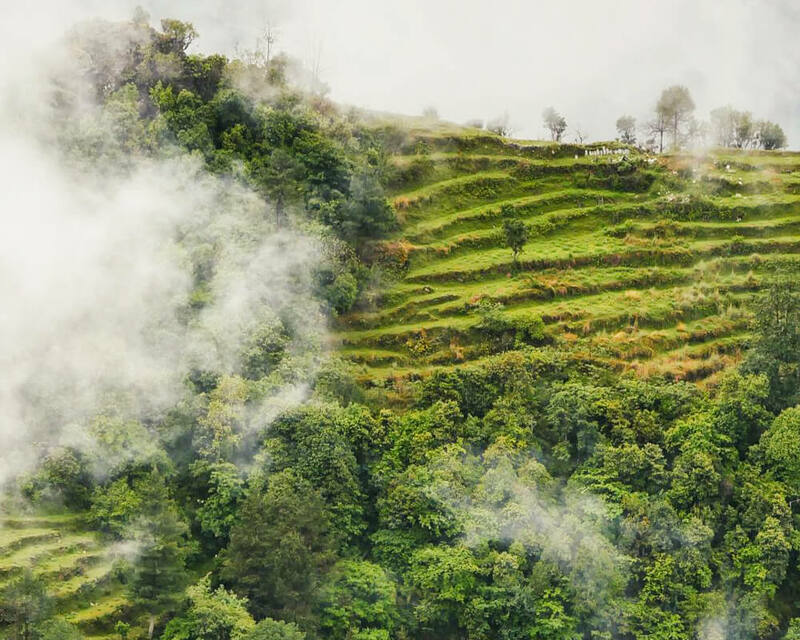 A dramatic landscape, Ha Giang also experiences dramatic weather events. Summer sees scorching temperatures, and the area is prone to flooding and landslides in the wet season. For this reason, the best time to visit is spring (from late February onwards). There are a few different ways to travel through Ha Giang. The most popular by far is by motorbike. Visitors can either hire a bike in Dong Van and self-drive (an option for the brave), or go ‘easy rider’ on the back of a bike with a driver/guide. If you’re not interested in riding, you can also visit Ha Giang by car. Ha Giang is still off the beaten track, but it’s currently at a tipping point. Time will tell what kind of an impact tourism will have on this part of Vietnam. If you do choose to go with a tour company, I highly recommend choosing a responsible tourism outfit such as YESD, a locally owned, women-led social enterprise that reinvests profits from tours back into local communities. Click here to check out the accommodation options in Ha Giang! 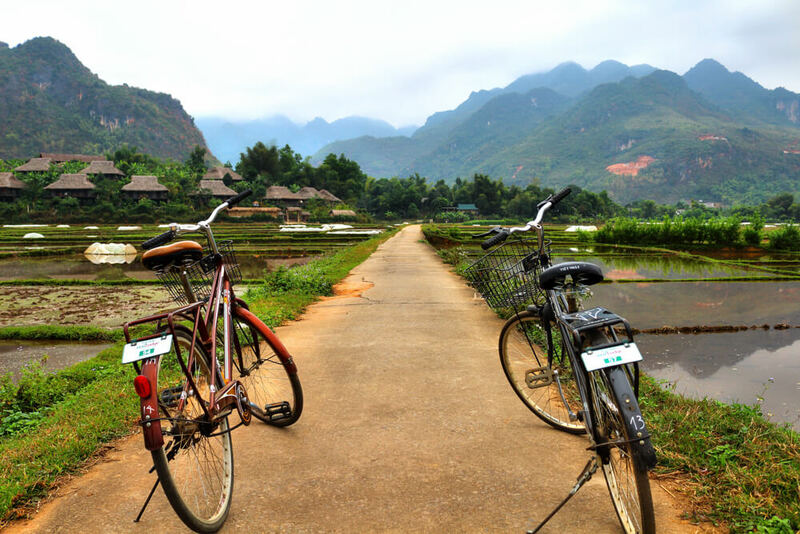 Nestled within stunning valleys in the province of Hoa Binh, 150 kilometres west of Vietnam’s capital Hanoi, Mai Chau town has become one of the best off the beaten track destinations in Asia thanks to its idyllic landscapes and rich cultural heritage. Coming to Mai Chau is an experience by itself. Imagine driving on the mountainside on long and winding roads through a sea of clouds. The high pass offers stunning views of the small and quaint town, along with many patches of green rice paddies within the towering mountains. There are two main villages near to Mai Chau that have become travellers’ favourites – Lac Village and Pom Coong Village. As Thai people have lived in the villages for hundreds of years, both villages have stilt houses that are typical of the Thai culture. There are plenty of souvenir stores that sell handmade Thai crafts like handbags, purses, and more. The rich nature of Mai Chau provides a lot of hiking possibilities. The Pu Luong Nature reserve, just at the edge of town, is home to many of the world’s endangered species – such as the Asian Black Bear and Palm Civet. 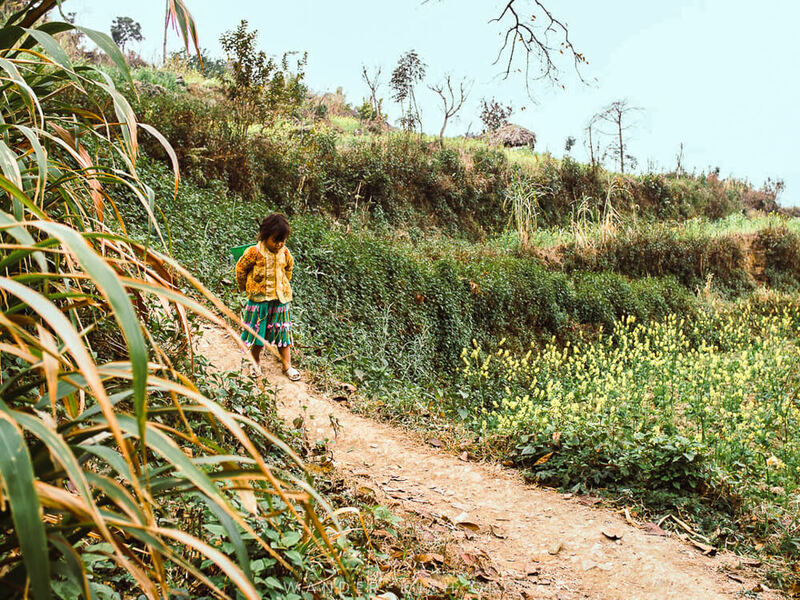 Along the trail, you will find smaller villages that are home to the ethnic minorities of Vietnam. Just a few minutes drive from the main town you can explore the Chieu Cave and the Hoa Binh Lake. Alternatively, rent a motorbike and drive through villages to observe the local life. Mai Chau is not only a beautiful town with stunning landscapes, but also has a rich culture that will charm visitors. Ethnic tribes are able to preserve their old traditions such as their unique weaving technique that can be seen in their clothes and their famed dance called Xoe – a dance of solidarity for the ethnic people in the area. Despite being off the beaten track, there’s plenty to discover in Mai Chau. Click here to check out accommodation in Mai Chau! Like this list of 22 underrated travel destinations and off the beaten path spots in Asia? Pin it! So many we need to add to ours too! Thank you! So glad this has been useful to you!